Should souvenirs featuring one of the most profane words in the English language be sold at a family-oriented market? It is a debate polarising Territorians following a Darwin Council alderman’s promise to put forward a motion tomorrow night that could see the Top End’s unofficial tourism slogan banned from items sold at the Nightcliff Markets. 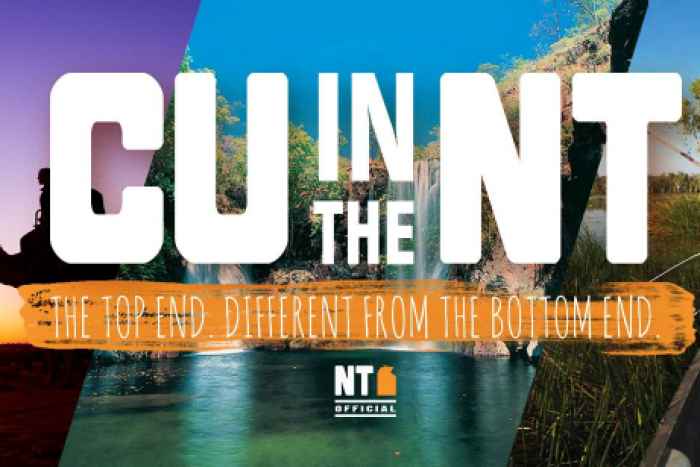 NT Official launched the “CU in the NT” slogan, along with the tagline “The Top End. Different from the bottom end” on its website in 2016, to mixed reviews. It now features on a range of souvenirs, which are sold at shops and market stalls. It seems the slogan has remained just as divisive. While some told the ABC it was taking the region “down the sewer”, others claimed it was among the “most creative and intelligent” things they had ever seen. Speaking to ABC Radio Darwin this morning, Mick from Malak said it was totally inappropriate to feature the slogan where children could see it, and recounted when he had seen a man wearing a “CU in the NT” shirt as he looked after his children. “There’s a place and time for all that sort of thing. Maybe if he’s at the pub it’s different,” he said. “But walking to the shops with his own kids, maybe they wouldn’t question it, but I think it’s pretty poor taste. Geoff from Berry Springs agreed, saying he found it quite offensive even though “I’ve spent my life in mining and road transport and knocked around some pretty rough areas”. “That sort of promotion is just taking us down the sewer,” he said. But the controversial tagline also had its fair share of supporters, with one person saying it had done more to put the Top End on the map than the NT Government’s $1.5m “Boundless Possible” campaign. Steve from Palmerston said it was in line with the famous headlines from Territory newspaper the NT News, and caught the attention of out-of-towners. “I had a friend that come up from Melbourne and he could not get enough of [the souvenirs],” he said. Born and bred Territorian Ross said it was one of “the best things in the Northern Territory”. “It’s one of the most creative and intelligent things I’ve ever heard,” he said. Pete called in from a yacht on Darwin Harbour, saying the whole debate was a storm in a teacup. “Get on with something more important,” he said. Tomorrow night, Darwin Council alderman Robin Knox will put forward a motion to seek legal advice on whether it could ban the sale of items featuring the slogan at the Nightcliff Markets. That could eventually see the slogan banned, depending on the result of the motion and the legal advice.